As I sit here, about to review this game, I’m staring at a piece of 16-grain sandpaper. It’s a nice piece of sandpaper. It was probably made from some wooden pulp somewhere in the past. It’s rough on my hands – it shines in the light, and it reflects in an odd manner depending on its relationship to the source of luminescence. One day, perhaps soon in the future, I will finish building my desk and I will use this sandpaper. I can only imagine that afterwards, it will lose some of the luster that it has. No doubt, in between the grains of sand will be small pieces of sawdust. I will have a nice, soft, smooth desk, but at what cost? The loss of luster? Would it be madness to take this piece of art, this piece of sandpaper, and put it to use, destroying the beauty? Perhaps. Perhaps it would be madness. But there are stores filled with sandpaper, and should I ever choose to use this piece, which I now hold dear, I would be able to replace it. No. This has nothing to do with the game Dungeon Explorer: Warriors of Ancient Arts. The above two paragraphs were a simple test. If you were riveted by my description of a piece of sandpaper and wanted to know what happens next, you’ll love this game. It’ll be right up your alley. The dungeon crawler sub-genre of action RPGs is a sad one indeed. Fundamentally, they favor repetition to the nth degree with the promise of better equipment and different level structure. And since these are the few requirements, it does tend to lend itself to sub-par games. Games like Kingdom Hearts, which have faults, are fun ARPGs, because they’re not confined to the parameters of a dungeon. This is not to say there are no good dungeon crawling games-there are very good ones out there. Diablo was fantastic. Diablo II, doubly so. Baldur’s Gate: Dark Alliance 1 and 2, Champions of Norrath – all excellent, fun games to play again and again. These are dungeon crawlers done right. Mediocre dungeon crawlers are like baby pigeons. No one can ever seem to find them, leading many to believe they simply do not exist. Which is true – but can be changed with the tinkering of the standard of “mediocre”. Because a mediocre dungeon crawler by any standard is a bad game. It’s boring, repetitive, leaves much to be desired. Often times, the develoeprs try and cram an absurd amount of story into an absurdly short game. Dungeon Explorer: Warriors of Ancient Arts is a bad dungeon crawler. Which, yes, by other standards, does make it an awful game. Of course, there are many classes to choose from. Some can equip certain items, while others cannot. There’s little difference between them – save that some have more magic than the other classes. It’s a good thing that for the most part, I didn’t use the magic. Excuse me, “Arts” as they’re called in-game. The game told me, as a Warrior, I should focus dumping stat-points into strength, as it would help me do more warrior-y things. So I did. Every level I gained, I would dump all of my stat points into strength. But for some odd reason, this doesn’t raise your HP. It increases your carrying capacity and how hard you can hit, but it left me incredibly vulnerable (especially because some equipment required a minimum amount of “Dex” to be worn). A gameplay fault? Simply that the weapons and armor sold are so weak, and there’s so much to pick up in dungeons, it was a rare occurrence that I would find not only something for my class, but my race, and finally, that I had the proper stats to equip. In hard mode, the weapon shop doesn’t re-stock. You’re stuck with the same lame beginning weapons. There are ways to upgrade your equipment, via “Reworking” the items at a black smith, but only once during the two playthroughs of the game did I ever get an item that was better than the one I had equipped. It was frustrating that the sword I picked up at the halfway point became the only weapon I used throughout the rest of the game. So let me tell you about the dungeons. There are monster generators that you can either beat the hell out of that spawn weak monsters, or use an item to destroy them. And then there are the standard denizens of the dungeon, zombies and goblins and things that do back flips for some reason. Every dungeon is exactly the same. Some have switches that you need to find. Some have hidden doors. But that’s it. There’s absolutely no innovation and no reason to play past the beginning dungeon, because it’s all exactly the same. There are no new skills to learn outside combat “Arts”, which vary by the random and somewhat arbitrary “School of Arts” (NYU?) you’re assigned to after the first quest. One small innovation is the use of a robot called the “Owon” which will follow you around and help you kill enemies. Here’s another problem. They’re not particularly useful. They help point out hidden passages, and they’re fine in the dungeon. Until the boss encounters, where they’re routinely killed in 2 hits. Then you have to go to town and buy a new one, which lets every monster in the dungeon respawn. Before they die, you can restore their life by feeding them your old equipment, or new equipment if you’re attached to the little bugger. The bosses come in 2 varieties: Sword swinging, armor-clad morons and specters that fly around and shoot at you. Sometimes the armor-clad morons shoot things at you, but every boss is the same. Save for your final encounter, which is just inexplicably bizarre. I won’t spoil anything when I say the final boss of the main quest is an egg. Yes, a giant laser-shooting egg. A laser-shooting egg. As in an egg that shoots large beams of refracted light. So after 4 hours, the goblins were 1 hit killing me (because I was putting all my stat points into “strength”), and I got frustrated, so I started over. 4 hours and 20 minutes into my new game, I put it down. I had completely finished it, save for the one optional side quest…which, after completion of the game turns into the main quest. In the 4 hours I put into my second file, I hit level 51 as I was finishing the game. For those who aren’t math inclined, that was about… 12 levels an hour. That’s a high rate of leveling – which made the stat boosts important, but annoying that every 4 minutes I had to open my status screen and distribute points. If I had persevered in my original file, I would have made it to the final boss, and cleared him out, had I been careful. I had, at that point, become adept at dodging projectiles, as they would clear me out in two hits. What I am trying to say is that the game is short. I did find there was a “Hard” mode to unlock as I was tooling around some of the other dungeons a second time, but it’s so freaking impossible, you’d better have a crapload of money stored for elixirs. There is an online mode as well, but I, for the life of me, could never connect to any games. I tried at my house, my dad’s house, my friends apartment, Panera, but I could never get any kind of connection despite having a signal strength more potent than Hercules. The graphics are… well, it’s like I took the aforementioned sandpaper and rubbed it all over the bottom screen of my DS. Everything was blurry and hard to differentiate. The characters looked the same – I was able to find people in the main town, Confine, by their location rather than how they or their shops looked. Even my character looked like a goofy pile of pixels. The sound quality isn’t horrible. However, before I played this, I played Final Fantasy: Rings of Fates, and was amused that they had voice acting. In this game, there’s the familiar high-pitched whir of speeding text boxes. And odd grunts during the frame story, which has an old goblin telling young goblins the story of the game, I suppose. I have no idea, though; as it didn’t really tie to the main story in any way I could tell. I should put a disclaimer that I was not involved in the mythology of the game at all. There are monuments scattered around that are in gibberish until you get an item which deciphers them, and they explain the history of the small land you’re exploring. But why would I want to go back to all the old markers? The one town, the characters don’t offer up any new information regarding the plot, save for the guy that gives you missions, and he gives you minimal exposition at best. The music is alright, I suppose. After the first dungeon, I turned the volume down because I was tired of the sound of my sword swinging and hitting things. It grated on my nerves to a high level. One final mark down – no use of the touch screen. I thought something was wrong with my DS when on the name entry screen, I tapped my stylus and nothing happened. I literally started the game over, thinking I had somehow screwed up before I began playing. It confused me. As I said, dungeon crawlers are tough to classify. They’re hit and miss. Don’t get me wrong, as I do love dungeon crawlers. I own Baldur’s Gate: Dark Alliance 2, which cost me an arm and a leg, but I love that game to death. I still play it about once every 2 months. When a dungeon crawler misses, they miss in such a bad way. They’re more boring than generic shooters or regular RPGs, they’re less inspired than generic sim games, and they’re far more frustrating than a mediocre rhythm game. 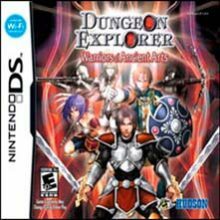 Dungeon Explorer: Warriors of Ancient Arts is a bad dungeon crawler, which does make it quite intolerable by any standards. Even when measured against other dungeon crawlers. You might want to give it a rent if you fell in love with my sandpaper story up there. On second thought, just don’t bother at all. Please. I’m begging you, spend your $30 on something more important, like half a blu-ray disc or a box of stale bagels. You have been warned. After 10 minutes, you’ve played through all the innovation the game wants to throw at you. Combat is tedious, magic is useless. Not even squat cartoon like figures. Lifelike realism, if lifelike realism means two color palettes and uninspired characters. Not atrocious, but I did turn it off after about an hour to listen to my brother fight with his friend during a match of Brawl. Absolutely nothing. Even the mediocrity and cringe-worthy moments were done before. A hard mode, and a multi-level pyramid. That’s about it. No side quests – the pyramid turns into the main quest post game.